World Poetry Celebrates Patrick De Moss from Canada! Ariadne’s Notes: The World Poetry Café Radio Show , on August 4th, CRFO 100.5 FM Welcomed The Talented Poet and author Patrick de Moss to the show with his creative and distinctive style of poetry. E-poems by Lini Grol , Canada and Chinese Poet Yuan Hongri! CLICK HERE to hear Patrick de Moss and Anupma Garg. World Poetry Café Radio Show Team: Ariadne Sawyer, MA, Radio Host and Producer, Neal Ryon, co-host, Engineer Victor Schwartzman , Volunteer: Sharon Rowe. Playwright, poet, prose writer, as well as former gravedigger, hotline psychic (no really), line cook, chef, waiter and a few other things in between, Patrick de Moss lives in the Vancouver area with his ghosts and good coffee. He is the author of the short story collection “Kings of Nowhere”, available on Amazon.ca, as well as three chapbooks of poetry – “Equinox”, “Lunephile” and “Lois Lane’s Lost Letters”. While trying to keep body and soul together he is working on a collection of poetry “Fertile Ground” and a novel that he seems to be keeping secret from even himself. just to get to sunrise. Patrick de Moss (C) All rights reserved. This entry was posted in Ariadne's Notes, E-Poets, Featured Poets, General and tagged Anupma Garg, Author Sharon Rowe, Dr. Ajay Garg, International Peace Award Ariadne Sawyer, Lini Grol, Neal Ryon, Patrick de Moss, Victor Schwartzman, Yuan Hongri on August 7, 2016 by Ariadne. World Poetry Celebrates Anupma Garg! Ariadne’s Notes: On August 4th, 1-2 pm, the World Poetry Café Radio Show ( CFRO, 100.5 FM) welcomed the singer and poetry scholar, Anupma Garg along with her husband, Dr. Ajay Garg in a special presentation of the poetry and music of India in English, Hindi and Sanskrit. A touch of the culture, poetry and music of India! 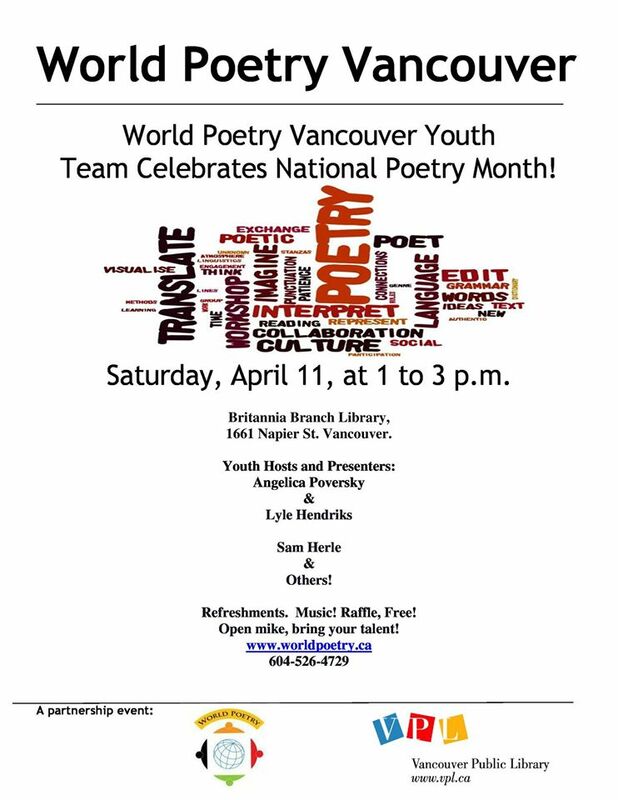 E-poems by Lini Grol , Canada and Chinese Poet Yuan Hongri! 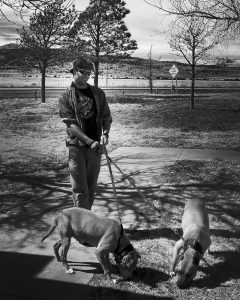 Also sharing the show, the poet Patrick De Moss who will have his own featured spot on site. A fascinating show! CLICK HERE to listen. Anupma has successfully completed M.Phil. in Library and Information Science and bachelor degree in Arts. After graduation, she embarked on a new journey where she had the privilege to work as Librarian in India. She absorbed a substantial knowledge and gained insights into the field. 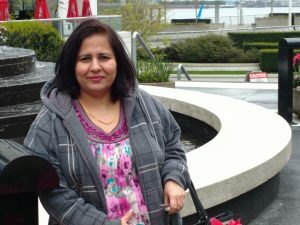 In an extensive experience, she acquired a good understanding of planning, e-office, records and document management. This entry was posted in Ariadne's Notes, General and tagged Anupma Garg, Author Sharon Rowe, Dr. Ajay Garg, International Peace Award Ariadne Sawyer, Lini Grol, Neal Ryon, Patrick de Moss, Victor Schwartzman, Yuan Hongri on August 6, 2016 by Ariadne. 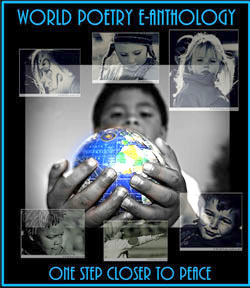 World Poetry Proudly Presents the Youth Poet Angelica Poversky ! The World Poetry Café Radio show March 31, on CFRO 100.5 FM with hosts Ariadne Sawyer and Wanda Kehewin welcomed an amazing multitalented youth poet, Angelica Poversky in an exciting show full of vibrant words. 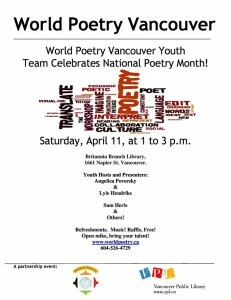 Angelica will be hosting the World Poetry Vancouver Youth Team , Saturday, April 11th, at the Britannia Public Library. All youth and others welcome. Also on the show music by Laura Kelsey and a special e-poem by Lini Grol. CLICK HERE for the show! 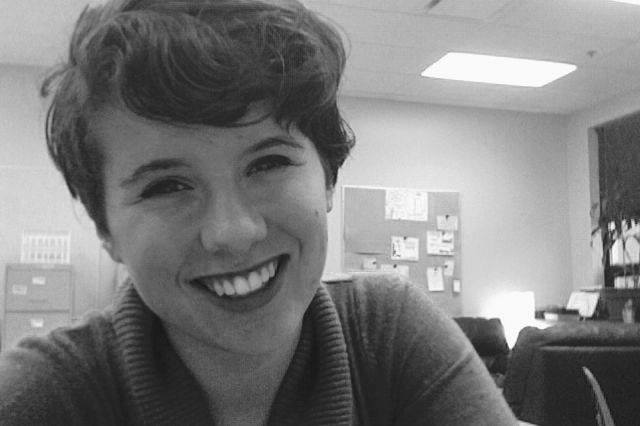 Angelica Poversky is 5’3″ of vertically challenged creative passion. She can be frequently found frolicking on hiking trails, writing articles and stories or twiddling her fingers on various instruments and organizing events. She’s a performance poet, musician, improv-er and a passionate nature lover. She is the founder and festival director of Richmond’s first youth-led outdoors arts festival, Arts in the Park and a guitarist and rapper of the folk group, Goons. She volunteers primarily with CPAWS, HUM and World Poetry. She gets paid with busking coins and children’s desire to learn guitar. Occasionally, she racks in the dollars through poetry or acting as a statue. 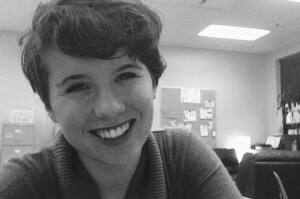 If you see Angelica in her natural habitat, she is probably working on her first poetry chapbook “She Is”, hosting her radio-show or training to be a stand-up comedian. Angelica is Vancouver’s Top 24 under 24 and a Richmond Arts Award Finalist. In 2014, she was an author at National Culture Days, TedX Presenter and a speaker at the CHIMO Violence Against Women Conference. The right click purchase button is on the bottom of the tongue of the gods. You’re the epitome of pain postponers. Your tragedy is travesty in my fabricated, factory eyes. Buy me. Your plastic dreams are gems, never good enough. Buy me. You are hung up on being better. Buy me. Better than others. Buy me. Snort coca-cola like it’s in your bloodstream as addictive as dopamine. can’t cope with not being the pope yet at the boulevard. You are still not happy, just corn syrup, cane sugar and caffeine. It is the fear that I am not good enough nor will ever be. Fear. Becomes the light of my existence. Fear. You won’t buy me. This entry was posted in Ariadne's Notes, Featured Poets, General, Ongoing World Poetry Events and tagged Angelica Poversky, International Peace Award Ariadne Sawyer, Laura Kelsey, Lini Grol, Wanda John-Kehewin on April 1, 2015 by Ariadne.